This Football Player Event Photo Folder is perfect for sports team photos, football camp, events at the stadium & more. Cardboard photo folder is designed to be used as is, or personalized with custom imprinting to advertise your company name, event, organization and/or logo. 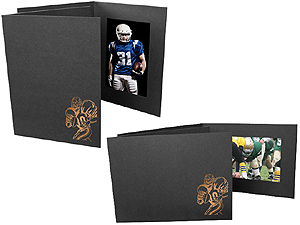 We use our Standard Black Photo Event Folder and then accent it with a football player in copper foil. The design is hot stamped (imprinted) right onto the front of the folder.